Apart from all those v's, what do VMware vSphere and Virgo have in common? Well you won't be surprised to learn that VMware, as well as contributing to the Virgo project, have shipped Virgo as part of their flagship virtualisation product vSphere 5.1. Virgo provides the web server for the vSphere Web Client. 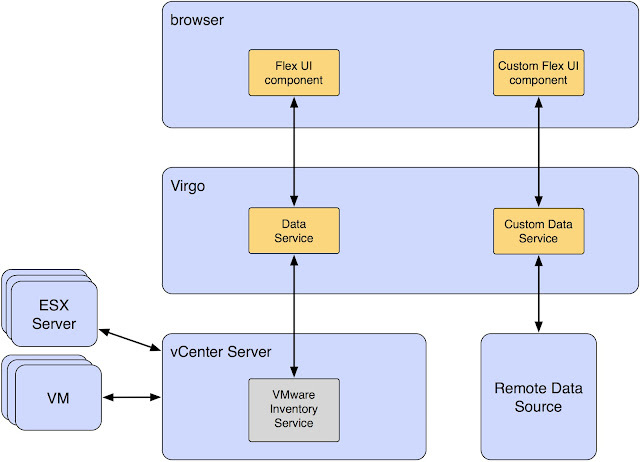 VMware chose Virgo in order to make the Web Client UI extensible. Users can write plugins defining Web Client extension points and containing WAR files, OSGi bundles and extension point configurations in order to supply Adobe Flex UI components and custom data services used by the UI. Plugins are registered with a vCenter Server and are automatically deployed to Virgo instances which connect to the vCenter Server. The result is a customisable UI and a customisable data layer that can serve up data either from the VMware Inventory Service or some other remote data source. Users can develop WAR files and OSGi bundles using the Virgo IDE tooling and VMware provides the configured Virgo server (known as Serenity), an SDK for developing extensions, and full documentation. See the SDK download page for these. Full documentation is provided in the vSphere Web Client Extensions Programming Guide. How are you using Virgo?